Indications: Proton pump inhibitor used to reduce stomach acid. Prevacid is prescribed to lower stomach acid to reduce symptoms of stomach ulcers and other digestive and stomach problems. Prevacid24, as sold over the counter, must be taken as prescribed with a four-month wait before treatment cycles. It is commonly prescribed and sold over the counter as Prevacid. Prevacid is available by prescription and over the counter. Patients should take one or the other only as taking more than the prescribed amount can cause side effects, including increased risk of bone fractures in the wrist, spine or hip. Prevacid should not be used daily for heartburn relief. Treatment lasts 14 days with a four-month wait before the next 14-day treatment cycle begins. It is best to seek medical attention for your heart burn before starting Prevacid. Some of the symptoms of heart burn are synonymous with heart attack symptoms. Your doctor may screen you for heart attack symptoms before suggesting Prevacid. Patients should report all medical conditions and current medications to their doctor when asking about Prevacid. Patients with liver disease or low magnesium levels should not take the medication without medical consent. Patients currently taking Carafate should take Prevacid at a different time of day than Carafate as Carafate inhibits the absorption of Prevacid. There should be a minimum 30-minute space between the two medications. In some cases your doctor may prescribe Prevacid with an antibiotic. Take both medications as directed until all prescriptions are empty. You may notice decreased or relieved symptoms before you've completed the medications, but don't stop taking them when symptoms disappear. If you notice difficulty swallowing, dark stools, chest pain, wheezing, weight loss, vomiting or stomach pain, stop taking Prevacid and contact your doctor immediately. There are no animal or human studies reporting difficulty conceiving while taking Prevacid. Prevacid is a safe and effective medication for treating stomach ulcers and other medical conditions associated with increased stomach acid. 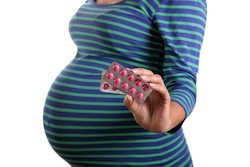 The drug can be used safely during pregnancy. There are no reported side effects and the drug has been on the market for more than 10 years – proving safety for use during pregnancy. Prevacid is in pregnancy category B as noted by the Food and Drug Administration. Prevacid is excreted in human milk, but there are no studies pertaining to possible health risk of breastfeeding infants, however the manufacturer of the medical claims possible serious adverse reaction. Patients are asked to choose between breastfeeding and Prevacid.